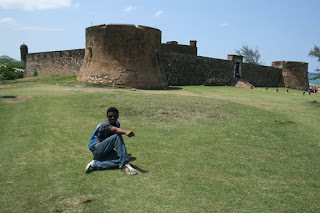 Mi Vida Sigue - My Life Continues: Costambar & Puerto Plata, Dom. Rep.
CAPTIONS: 1. 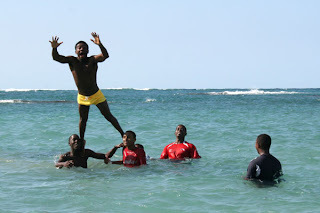 Andre goofing around at the beach with friends, 2. 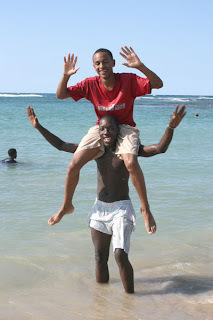 Vashti's son Raynolph on Junior's shoulders, 3. 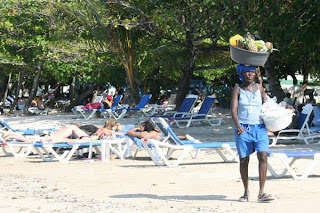 Haitian vendor at Costambar Beach, 4. Josi's baby is due any day now, 5. 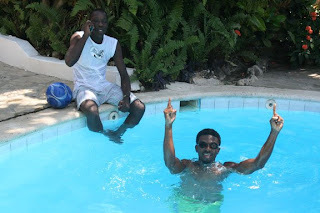 Junior and Andre enjoy the pool at L'Oase, 6.The view from Joseph's new vacation home. 7. Racquetball champs from Santo Domingo, Alberto and brother Danelis, with their wives Josi and Gladys, 8. Doubles action at L'Oase, 9. 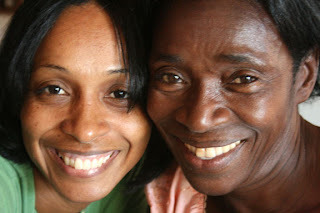 Our host Vashti and her mother, 10. 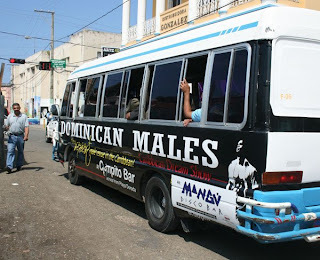 Vashti's relatives joined us for a BBQ, 11. bus ad for "Dominican Males" in Puerto Plata, 12-14. 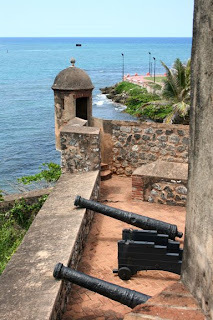 The fort in Puerto Plata, 15. Posing with one of the locals, 16. 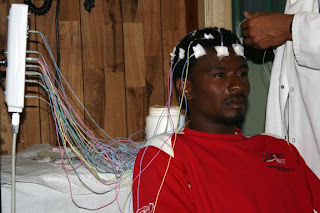 Andre gets an EEG. 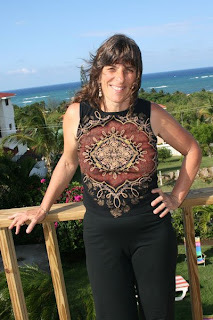 Andre and I have been enjoying ourselves at L'Oase on the north coast of Dominican Republic in Costambar, a gated tourist community. When we get tired of the peace and quiet, we can hop on a moto-taxi for about $2 and ride into downtown Puerto Plata 10 minutes away. That's exactly what we did to find a neurologist for Andre. He'd been having headaches again and was worried it might mean something serious. I had my doubts, but figured it would be a lot cheaper to have studies done down here than in the U.S. I was right on both accounts -- the EEG cost $35 and the neurologist assured Andre there's nothing wrong with his brain. Probably just the stress of waiting for his visa. I called the US Consulate in Santo Domingo today since it's been two weeks since they said two more weeks. Today they said call back in a week. I guess that means I'll have to change his May 6th reservation. I go back to California on Monday, May 5th. We're inviting all our Santo Domingo friends to Pizza Hut on El Conde pedestrian zone the night before. That's always easier than trying to make the rounds to visit everyone. Last weekend we invited Andre's best friend Junior and his sister Paula to join us up here at L'Oase, but Paula just found a new job and couldn't come. Joseph, the hotel owner and a racquetball fanatic from way back, suggested we also invite brothers Alberto and Danelis, two of the best players in the country, who also coached Andre while I was in California. They brought their pregnant wives, Josi and Gladys. Gladys is barely showing, but Josi said her due date is now. We prepared ourselves for some excitement, but as far as we know, her son Alberto Jr. still hasn't made his appearance. On Saturday we played in the pool, then went down to the beach to get wet again. 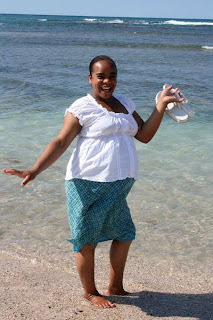 We walked the long, scenic route, which proved to be a bit much for the pregnant wives, but still no labor pains. That night I took everyone out for rotisserie chicken. 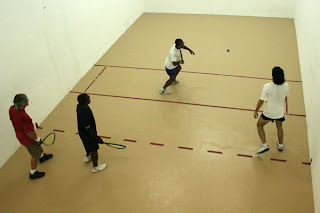 We played racquetball Saturday evening and Sunday morning. 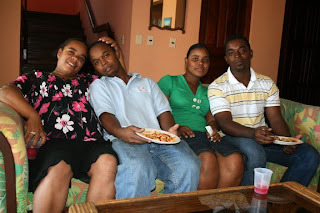 Then Joseph and his Dominican girlfriend Vashti hosted a big BBQ at their vacation home for Vashti's family, some business associates of Joseph's, and our gang. Andre and Junior slipped away to play soccer with a couple of Canadians and about 20 Haitians. As Junior and the two couples were leaving to catch their bus back to the capitol, they all promised to come back soon. 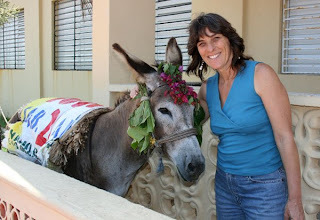 Life here in this small gated community is so much safer and more mellow than in Santo Domingo, the Land of Thieves. I didn't tell you, but Junior's new call center was recently robbed by three thieves with a pistol, getting away with a new laptop and cash. Luckily, Junior listened to Andre and put his motorcycle inside the locked area or he would have lost that too. 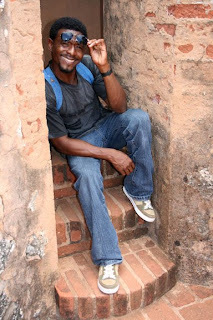 Another day, Andre got roughed up by the Dominican police (yet again), for being Haitian. Even though he was tempted to lose his temper with these racist pigs, he called on our friends Lenni and Susanne to do the talking, since we can't afford any complications for his visa. Andre and I have been playing racquetball once or twice a day, swimming, walking and swimming at the beach, and enjoying some great German food and fresh bread with our friends Reiner and Beatriz at R&B Bakery. Their little girl Ana reminds me of Maya, but we don't get to see her much because she goes to school in Puerto Plata and is gone most of the day. Last weekend she went to stay with her aunt., who is a veterinarian for the Santo Domingo Zoo. What a treat for Ana to see the wild animals up close and personal!